This entry was posted on November 19, 2013 by Jessica Anderson. Two weeks ago, I wrote a blog post about behind-the-scenes at our Renton Production facility. This week I'd like to feature our Issaquah Showroom and Customer Service Team. Come visit our showroom located 15 miles east of Seattle, WA. If you would like to see samples of our beautiful trophies and awards, our Issaquah Showroom is the perfect place to browse. 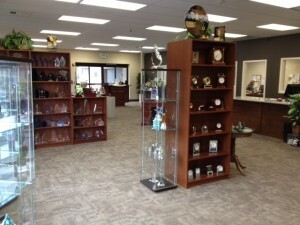 Our spacious 1200 sq foot showroom offers samples of both our sports trophies and our corporate awards. We have been serving the communities of Issaquah, Sammamish, Bellevue, Renton, Newcastle, Snoqualmie and North Bend since 1987. Meet Our Customer Service Team! When you come to our showroom, you will be greeted by one of our knowledgeable and friendly customer service staff. Learn more about them below. Margene has been with our company for 10 years! Margene has been with Trophies2Go for 10 years. Not only does she help customers both in person and on the phone, but she also researches and writes descriptions for many of the products we offer. A woman of many talents, Margene also does bookkeeping, billing and HR tasks for our company. She also follows up with many customers after ordering to see if she can help with anything else. 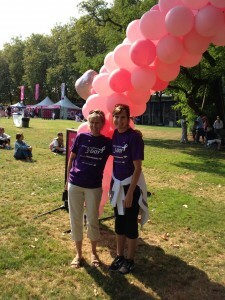 Janice, who has been with T2G for 6 years, is our Customer Service Lead and resident Canadian. If a detail needs to be added or changed to your order, Janice is the one to see it gets done. She also runs our 'Awards for A Cause Program', where we donate a portion of proceeds from featured awards to charity each quarter. Mika on the phone helping a customer. Mika works part time in customer service and has been with Trophies2Go for 3 years. 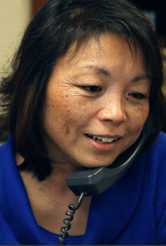 In addition to taking care of our customers, she also runs a successful real estate business. She is passionate about giving great service and her customers love her! Have an old trophy that needs the newest winner etched onto it? Mike is our go-to guy. He engraves most of our perpetual trophies and plates. He's also our "work husband" who does all of the odd-and-end chores we need done to the showroom. He has been with us for 7 years. Our President Jeff is the company's strategic thinker and resident goof ball. He's a fun loving guy who works harder than anyone I know but doesn't take things too seriously (unless he’s in a competition, then he's pretty intense!) If there’s a fire to be put out, Jeff's our man. Janice & Jessica at the 2012 Seattle Komen 3-Day Walk. I, Jessica, also work in Issaquah, as the Social Media and Marketing gal. With Margene and Jeff's help, I also bless new products and ax old ones from the website and showroom. That's the Issaquah Trophies2Go Team in action! We love helping you create the perfect memory with an awesome award! Whether it's trophies for a team, a longest drive award a golf tournament, a fantasy football championship trophy, crystal awards for an annual Gala, or a plaque for an ongoing Employee of the Month program, our Issaquah staff can help you choose the perfect award in time for your event. We are experts in our field, as you are in yours, and take great pride in creating meaningful awards customized just for you!